The youngest of the three big annual RHS flower shows, but by no way a poor cousin, the carnival themed Tatton park show delighted and impressed this year as always. With a carnival theme running through the show for a second year, and twice daily carnival parades through the showground with dancing butterflies, this was yet again a colourful and action packed show for all to see. The 28 acres of National Trust estate was transformed for a brief frenetic period with an estimated 80,000 visitors attending the show this year; drinking 14,000 cups of tea and 300 bottles of Champagne and eating 6,500 pork rolls throughout its duration. The showground was divided into three zones; Feast, Grow and Inspire. In Grow Zone you found all things plant-related, whilst in the Inspire Zone you found many of the Show Gardens, including 3 gardens for the International Year of Light. This was initiated by the United Nations to highlight the vital role that light plays in providing solutions to global challenges. Finally the focus in the Feast zone was the growing of food. For me the highlight of the show this year was the new Garden Hideaways area. 6 x 4 ft garden sheds were transformed into bespoke designs, creating much colour and real talking points. What is a garden without a great shed? 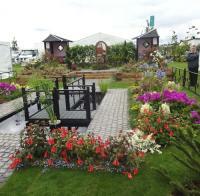 The main foci of the show are always the show gardens (29 this year) designed to delight and amaze. There were a wide variety of standards, content and designs and I particularly liked the use of Achillea ‘Desert Eve Red’ in many of the gardens this year. Another highlight for me was the return of the Back to Back Gardens after being absent for 3 years. They really show what you can do with a small plot with the 12 gardens embracing a broad range of themes and design styles. 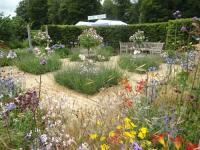 My favourite was Melitta which won Gold and Best Small Garden. Designed to attract bees, with a blaze of colourful perennials, hexagonal structures representing honeycombs, handmade wicker bees and a bench designed to create a space for contemplation. Picking up the Pieces, which won Silver. This garden was created by female prisoners at HMP and YOI Styal, and was about making a path through the mess that got them into prison in the first place. With an inspiration and a wish to move forward in their lives, the garden was a metaphor for overcoming obstacles as well as a place in which to reflect and realise that every situation can be overcome. Featuring monkey puzzle trees, spikey and a puzzle in their own way, and flower beds; a jangle of colour, bright and attractive yet confusing, reflecting a part of a life trying to sort itself out. Big fences made out of jigsaw pieces enclosed three sides of the garden, representing prison walls and fences. Then when you got to the top part of the garden and walked up 3 steps the colours harmonised, shapes balanced and it became a place of tranquillity. A very nice, unusual and different garden with a lot of meaning and thought. The Perennial Legacy Garden supported by Glendale, which won Gold and Best Show Garden. It was designed to reflect elements of a large English country estate, featuring a large grass area down the middle of the garden, which has two uses; a lawn and path. This was set off with extraordinary herbaceous borders either side creating a vista intense with colour. The garden featured a pavilion for relaxing and enjoying the garden, and a separate walled working garden with a gardener’s bothy and nursery beds situated to its rear. This garden was packed full of interest and colour. The Water Gardens category was a new feature for this year. The three Water Gardens all contained water in various ways for its movement, sound and reflective quality. My favourite was The Water Garden, which won Silver. It was so clean, crisp, and colourful and I loved its use of natural stone. The RHS Young Designer of the Year Gardens competition had three up and coming garden designers taking on the challenge of creating a show garden to the theme of "An English Country Garden." The competition was won by Tamara Bridge, with ‘The Sunset Garden’. The garden was perfection with a variety of colours, very pretty and quintessentially ‘English’! The Floral Marquee was the perfect place to find something new for your garden or enjoy the RHS Potting Benches with live demonstrations and short interactive sessions. My favourite displays were the South African Disa Orchids, Zantedeschia’s, Gladiolus, Clematis and the fascinating Bonsai trees. Whatever appeals to you the kaleidoscope of colours on show certainly brighten up the day. With 2015 being the Year of the Sunflower, many different shapes and sizes of sunflowers were also on display in the show. The best view of the Show was undoubtedly from the flowery ferris wheel, which was decorated so beautifully by North West NAFAS. A great feature of the showground. In all a great show to steal ideas for your own garden with different treats round every corner and as much inspiration as you can absorb. Published on 01 Aug 2015 and Filed under Reviews.